Let me start by saying that those who like this show tend to REALLY like this show. If I come across as an insufficiently devoted fanboy, I apologize in advance. The pseudo-pilot went viral online almost immediately, and it was only a question of when a network (presumably Nickelodeon) would develop the concept into a series. But Nickelodeon remained surprisingly mum on the subject. Expectant viewers had to wait nearly 2 years before we learned that the series had been picked up by Nick rival Cartoon Network, where it finally debuted in April of 2010. John DiMaggio (voice of Futurama’s Bender) returned as Jake the Dog, while other characters were recast: The protagonist, now named Finn, was voiced by the “Pen” actor’s younger brother, Princess Bubblegum by Hynden “Starfire” Walch, and the Ice King by Tom “Spongebob” Kenny. The art also received a major overhaul. While the characters for the most part kept their simple designs, the background visuals grew more fantastic and intricate by an order of magnitude. The key elements of the original short endure. The series more or less fits beneath the umbrella of the adolescent fantasy genre, and the influence of properties such as Dungeons & Dragons and the Legend of Zelda is readily apparent. One fantasy trope played to comic effect is the overabundance of princesses. 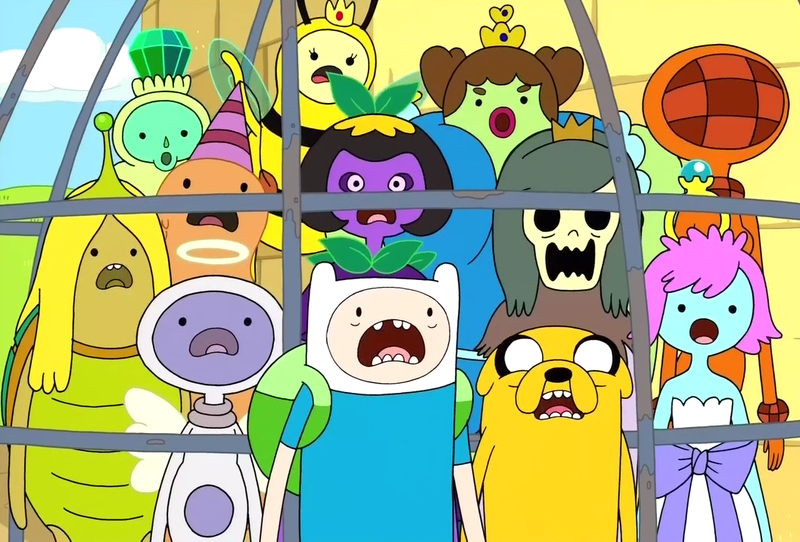 Finn & Jake’s world, dubbed “Ooo” in the series, contains a nearly endless assortment of sentient beings, and it seems each and every race has a princess at the helm. In addition to Bubblegum, the bevy of royals we’ve met so far have included Hot Dog Princess, Ragdoll Princess, Wildberry Princess, and the extradimensional Lumpy Space Princess, voiced by Pendleton Ward himself. There’s even a Doctor Princess…though she points out that, in her case, “Princess” is merely her surname. Finn, Jake, and a spectrum of captive princesses. The penchant for randomness likewise remains intact. Characters may break into inexplicably auto-tuned song, or offer dancing lessons to passing insects. The finale of one episode revolves around “The Party God,” a flying wolf head with a frat-boy personality. In my Film Favorites review of Monty Python and the Holy Grail, I criticized so-called “random humor” for failing to meet a basic criterion of comedy. Humor requires the creation of expectation in an audience, so that that expectation can then be subverted in a “funny” way. Randomness doesn’t create expectation, and so is typically unfunny. But Adventure Time embodies the positive as well as the negative aspects of randomness. The series feels like the television equivalent of a “sandbox”-style video game. Here, there are limitless possibilities. Anything can happen. Some of the very best episodes are those which experiment with the standard structure. “Thank You” (S3,E17), for instance, is almost entirely devoid of dialogue, and features Finn and Jake only as background characters. The main thrust of the story follows a snow golem (a legendary creature introduced in the pilot) as he goes about his day. Early on, the peaceful arctic giant is beset by a pack of fire-wolves. He shoos the infernal hounds away, but then finds a fire-wolf pup who has become separated from the group. In a genuinely heartwarming sequence, the opposing elementals bond, with the snow golem finding unique solutions to the problems of housing, feeding, and snuggling the puppy, all without uttering a word. Eventually, the golem realizes he must return the wolf pup to its fiery home. Risking frosty life and limb, the snow golem journeys through the volcanic wasteland, barely returning in time to avoid a grim, wet fate. It’s a surprisingly emotional 11 minutes, and, like yesterday’s selection, shows that nonverbal storytelling didn’t die with the silent era. In fact, “surprisingly emotional” is a good description of the series in general. Over the course of the show, the backstory of Ooo has been revealed in dribs and drabs, and it’s unexpectedly dark. Early in the series, we get a brief view of the planet from space, and see that it looks very much like Earth…with a sizable chunk blasted out of it. Later, Finn makes a throwaway reference to a “Mushroom War” in the distant past, subtly implying that Ooo represents the far-future aftermath of a nuclear apocalypse. The story grew deeper and darker still. 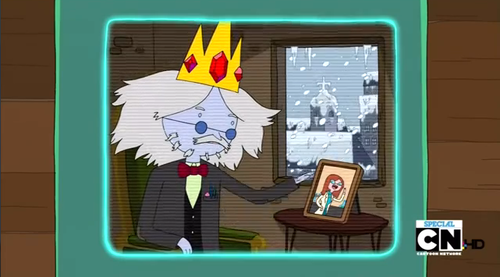 In “Remember You” and “Simon & Marcy,” we learn that the Ice King (original name Simon Petrikov) and his tale actually pre-date the Mushroom War. In addition to driving him mad, the magic crown also rendered him invulnerable to radiation and other apocalyptic nastiness, allowing him to survive in the wasteland for centuries. While still on the relatively “nice” side of the spectrum, he happened upon a young vampire girl, whose condition likewise left her immortal. Together, the two of them weathered the ages, though “Simon’s” madness eventually caused him to forget her. 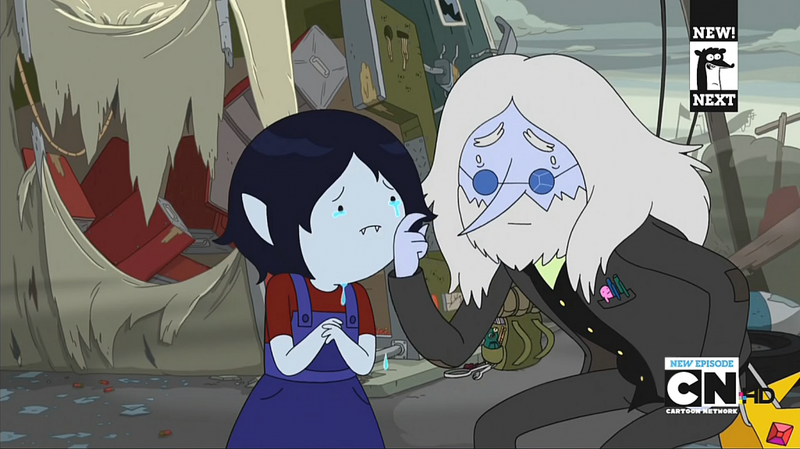 In the “present” of the series, Marceline (the Vampire Queen) is a lead character and ally of Finn who can only look on sadly at the shell of the man with whom she shared a millennium. 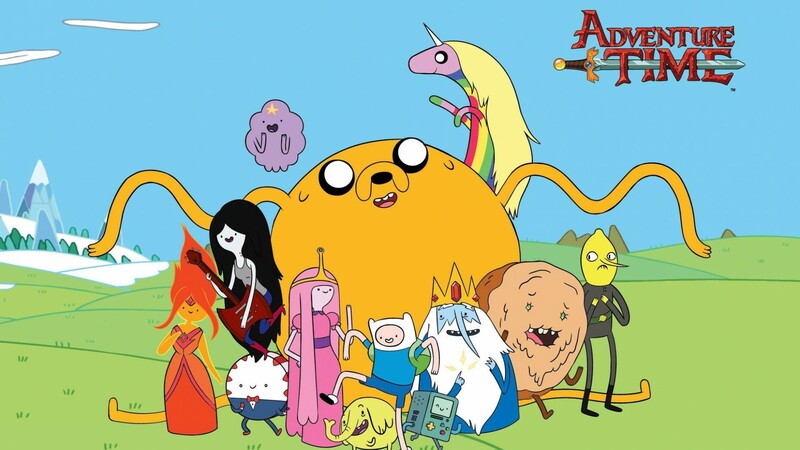 As I mentioned at the beginning of this post, Adventure Time’s quirky style has attracted a strong fan following, particularly among teenagers and young adults, and the show’s creators seem to engage in a fair bit of back-and-forth with fans. Now, I can’t say for sure whether it was the crew’s own willingness to try new things, or the abundance of fanmade “Rule 63” art `on the internet, or some combination of the two, but “Fionna & Cake” (S3E9) introduced a parallel, completely gender-swapped cast. Finn, or rather, “Fionna,” is a feisty girl adventurer, and Jake’s counterpart a sassy cat. There are also male analogues of Princess Bubblegum and Marceline: The preening “Prince Gumball,” voiced to perfection by Neil Patrick Harris, and “Marshall Lee,” played by Community’s Donald Glover. The alternate lineup proved so popular that two more episodes continuing their story have been produced thus far. Adventure Time tries so many things and goes so many places thematically and stylistically that it’s hard for me to describe it succinctly. But while I’ve got your ear, I’ll mention one final element of the production that’s not to be missed: the music. Every other episode or so will feature some kind of song, often provided either by Marceline (a rocker girl in addition to a vampire) or BMO, Finn & Jake’s sentient computer. Like other aspects of the show, these songs strike me as a bit too scattershot at times. The oddly autotuned numbers, complete with seemingly improvised lyrics, add little in terms of entertainment or narrative advancement. And yet, other tunes are endlessly catchy and evocative, such as the infectious “Makin’ Bacon Pancakes” or the dreamy “Island Song” which ends each episode. Still other songs stand out for completely different reasons. “Just Your Problem,” for instance (S3E10), comes almost out of nowhere and strongly hints of a past lesbian relationship between Marceline and Bubblegum. More fuel for speculation-inclined fans, I suppose. Already in its sixth season, Adventure Time is still going strong. I tend to get caught up with the series sporadically, while watching with more-obsessed friends. But though I haven’t seen many of the most recent episodes, if the abundance of Finn and/or Fionna cosplayers at every convention I’ve been to is any indicator, there’s enough audience interest to drive the adventures of Jake the Dog and Finn the Human for a few more years at least. 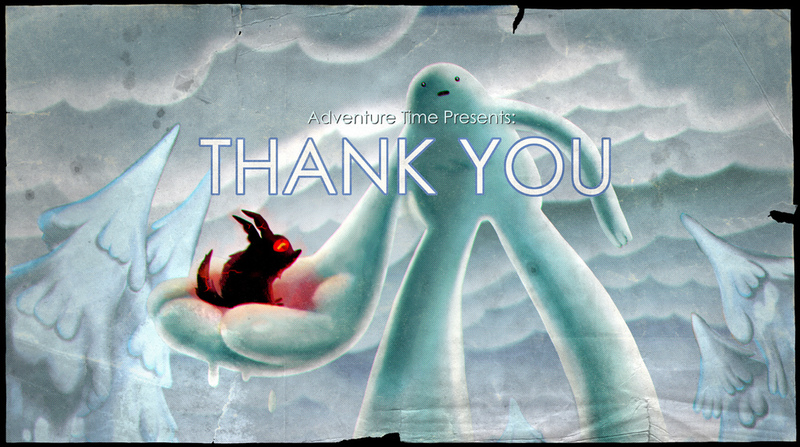 While not every joke might “land” nor every song prove a musical masterpiece, on the whole I admire Adventure Time greatly. I don’t know if I can think of a single other show that’s as silly AND sad AND colorful AND trippy AND romantic AND deranged. In fact, just about the only adjective I can’t find evidence for ascribing to this series is “formulaic.” Unlike with so many other TV shows – including, I must admit, many to come – you never know what to expect. The series has featured an impressive variety of cameo voice actors, including (a criminally underutilized) Weird Al Yankovic as a spacefaring banana, and Emo Phillips (aka the mutilated shop teacher from UHF) as a Rod Serling-esque host/narrator who pops up from time to time.